On Ring's Pond. Photo by Kevin Quigley. 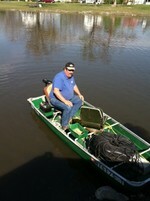 Town supervisor Kevin Quigley took this photo of grounds superintendent Albert Conley who took a small motor boat into Ring's Pond on Monday to install a water aerator.